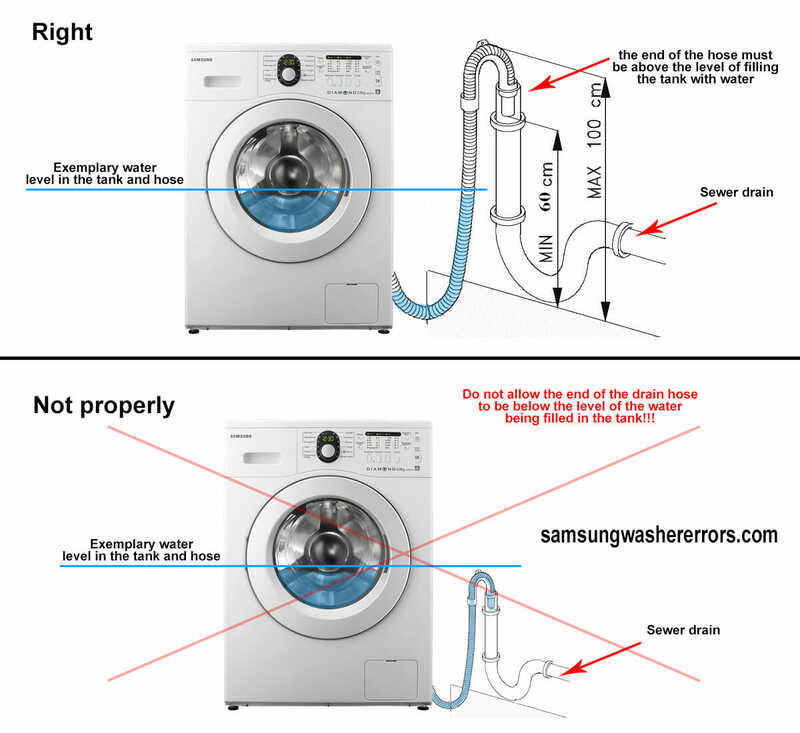 The 4E error in Samsung washers can appear both at the start and during the final rinsing of the laundry. It is easiest to identify a malfunction when turning on. After the start, you don’t hear the characteristic sound of the water set. The 4E error, similar to 4E, 4C, and E1, describe a common problem. For some reason, the machine does not gain water. The washing machine without a display informs about the fault by activating all the light bulbs. In addition, the “Coldwater” indicator lights up. The old Samsung model with a display shows the E1 code on a screen. Before fixing the device or ordering a repair, try to test it yourself. Sometimes the malfunction of the washing machine is caused by external causes. If the machine gives the 4E error, check if the water supply in the building is switched off. Make sure that the tap, providing water to the washing machine, is completely open. 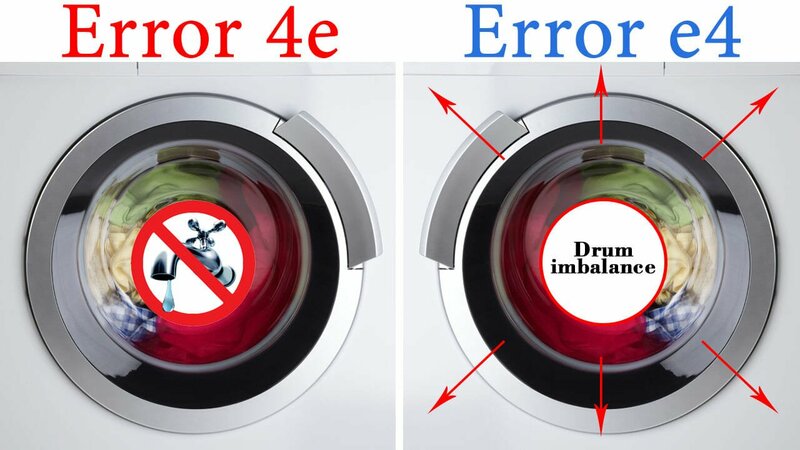 There are no interruptions with water supply, but the Samsung washing machines show the 4E code. What to do next? If you face with the 4E error code for the first time, try to reboot the electronic unit. Turn off the machine for a couple of minutes from the network. After this, the glitch of the control module will disappear. If the fault reset doesn’t occur and the 4E continues to light up, start checking the washer hardware. Small objects could damage or clog the cleaning filter at the entrance to the washer. It causes the 4E error code. You can fix this problem yourself. Find the filter (it is located at the junction of the hose and the body). Shut off the water supply, unscrew the hose, remove the mesh. If there is little dirt, just wash the filter. A solution of citric acid will remove the scale on the mesh (keep the mesh in the solution for about an hour). The machine provides a set of water but immediately merges it (the temperature of the incoming liquid does not matter). This happens when the installation is incorrect. In this case, the tank is located above the sewer drain point, and the compensating loop is not laid on the hose. The correct connection will remove the error. If the measures you have taken don’t work, and the Samsung machine still shows the error code, it requires a qualified repair. The table will help you to understand the causes of the fault codes. The washing machine doesn’t gain enough water. In some cases, the device doesn’t fill water at all. A display shows the E1, 4E or 4C error code. The inlet valve has become unusable. Change the part. When the washing starts, the machine issues the 4E error. The problem refers to the pressure switch. Most likely, the hose has moved, clogged or mechanically damaged. Usually, in case of the water level sensor malfunctioning, the 1E error code appears. Replace or repair the hose. Water doesn’t get into the washing machine. In a short time after starting, the device issues the 4E error code. Damage to the wires between the electronic unit and the water inlet valve. Reconnect the wiring or replace the plume. Are 4E and E4 the same? problems with the electronic controller. There are defects in the details of the machine drive parts.